An apex body for business bodies within the country and another for across different countries was formed on the second day of the three-day-long Vibrant Gujarat Summit, 2019. According to business representatives, the move will bring in synergy among chambers of commerce and industry across geographies. This will lead to greater mutual trade, creation of new jobs, and more government revenue. "We kickstarted the formation of Global Chambers' Forum – the global body, and Consortium of National Chambers, on Saturday. 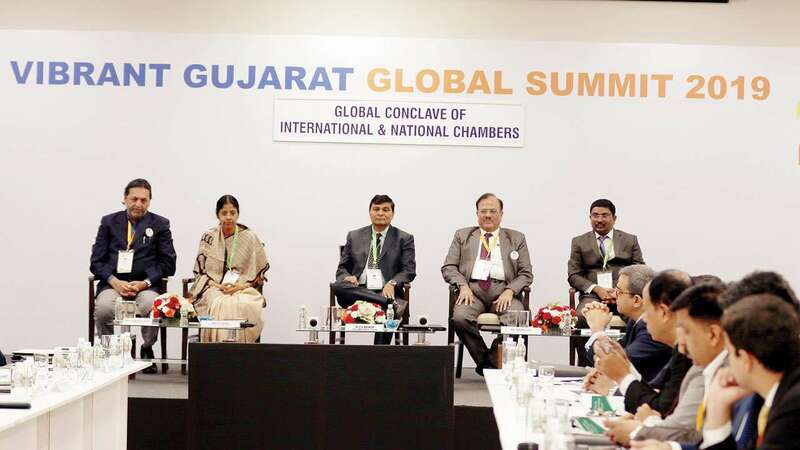 We have formed the India Chapter of Global Chambers' Forum," Jaimin Vasa, president of Gujarat Chamber of Commerce and Industry (GCCI), said while interacting with media persons on the sidelines of 'Global Conclave of International Chambers' during the Vibrant Gujarat Summit, 2019. Around 40 bodies of trade and industry from different countries and about 24 from different parts of the nation participated in the conclave. The GCCI also inked a Memorandum of Understanding (MoU) with 27 chambers of commerce for partnership and cooperation. Vasa said, gradually, membership of the Forum and Consortium will be expanded as more and more trade bodies will express their readiness to join them. Trade bodies from Arizona, Kentucky, Dubai, Tanzania, Uganda, Bhutan, Nepal, Canada, Singapore, Hong Kong, Australia, SAARC Chambers, Bangladesh, BRICS, and Ghana participated in the conclave. "With regard to globalisation, the coming together of trade bodies is the need of the hour. We can act as a common advocacy group to represent our cases to the governments. We will also be able to explore business opportunities that were unknown to us so far. With increase in trade and commerce, we will be able to create more jobs for the youth and revenue for the governments," Vasa said.